First Sunday of the month (not August) we hold a service in the hall which is a bit less formal than the usual services, with contemporary music. 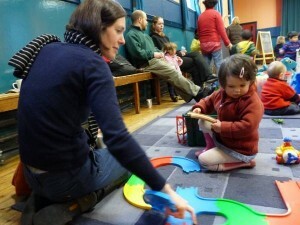 Baby & toddler group meets in the hall Monday and Thursday morning during term times. Mums, dads, grans and carers gather for some vital adult company, while the children trundle about playing with trikes, mini climbing frame and other toys. We always have a healthy snack. Older children (8-16) are welcome to join the St Peter’s Choir. Run by Rupert Forbes and Sheila Chisholm, junior choristers rehearse together on Thursday evenings during term time 6 – 7 pm. We cover sacred music from the Rennaissance to the present day. 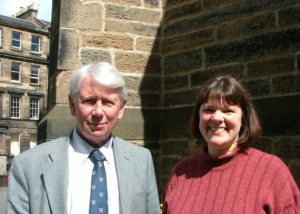 Sheila also teaches the Royal School of Church Music Voice for Life syllabus. VfL helps singers develop with vocal exercises, posture, breathing and diction; listening skills, music theory and notation. Children sing alongside the adult choir on Sunday mornings 10 am – 12 pm at least two Sundays a month (more often if you like). Junior choristers join the younger children at Children’s Church for part of the morning. We then rejoin the adults for communion and the last anthems and hymns. “St Peter’s junior choir has taught my son to read music and sight sing. It taught him the musical theory that his otherwise wonderful violin teacher didn’t cover. A first rate musical education.” Liz, mum of a chorister. If you’d like to know more about what is involved contact Rupert on 0131 664 3030.